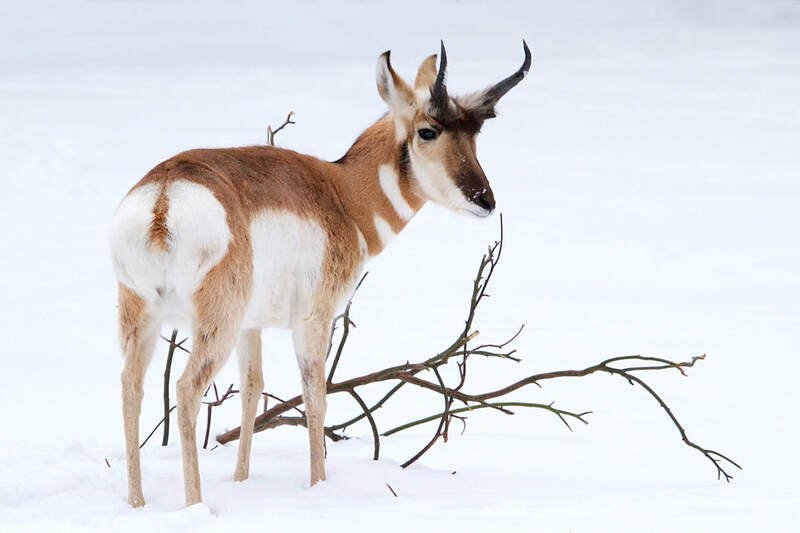 Pronghorn have a light brown coat with white undersides. Males have black cheek patches and forked, diverging horns. Females lack cheek patches and have either much smaller or no horns. Both sexes have a white rump patch with erectile hairs that are raised in times of danger and flight. Pronghorn can weigh between 90 and 155 pounds. Grasslands, brush lands, sagebrush steppe, deserts and alpine plateaus. Pronghorn are found in western and mid-western North America. Pronghorn are browsers, eating leaves, herbaceous plants or shrubs, but not grasses. 7 to 15 years in captivity, 1 to 6 in the wild. Herds are normally family groups with a single male (buck) watching over several females (does) and their young (kids or fawns). A doe will give birth to one to three kids during spring. While once numbering in the millions, these animals were extensively hunted. They now have a stabilized population around 600,000. They still face shrinking habitat due to farming, ranching and other human development. The Sonoran subspecies is endangered. Pronghorn are the fastest land mammal in North America. These animals can run at top speeds of 58 mph for short distances and can cruise steadily at 32 mph. 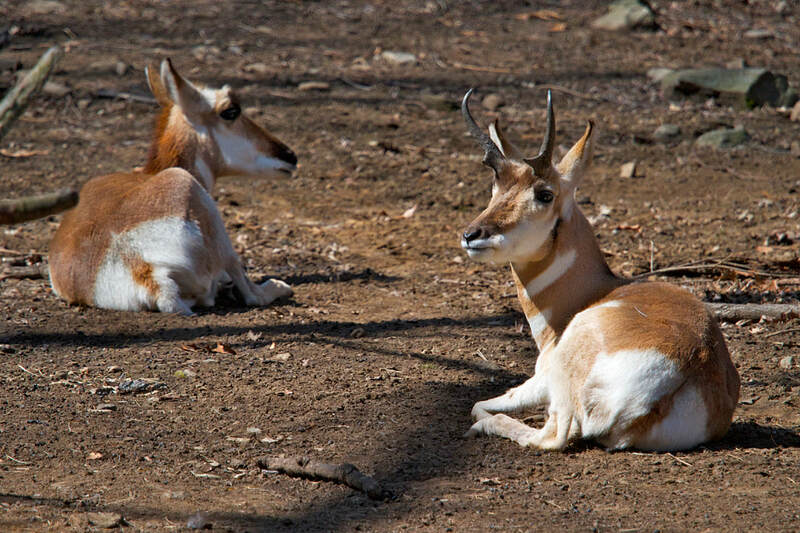 Named for their horns; pronghorn do not actually have true horns. They have a permanent bone core covered with a keratinous sheath comprised of hard-packed hairs. It is shed each year after the breeding season. The shed sheath is eaten by mice, squirrels and rabbits. Pronghorn are unique in the animal kingdom with this type of shed horn.